MySpace has started the global roll-out of MySpace Mail, the social networking’s email service. MySpace Mail is intended to help MySpace users to communicate and share content with people both inside and outside of the MySpace network. The announcement follows growing speculation that the suffering network had devised the new service in an attempt to retain its declining userbase and attract new members. Users around the world should expect to see the service rolled out in beta over the next two weeks. The company describes the email service as blending “the best of social networking and traditional mail”. MySpace Mail is intended to help MySpace users to communicate and share content with people both inside and outside of the MySpace network. The site’s current messaging platform accounts for almost 20 per cent of its traffic, according to the company’s own figures. All MySpace users who have registered their own “vanity URLs”, a personal MySpace web address, have a MySpace Mail address reserved and waiting for them. For example, if a user’s profile URL is: www. Myspace.com/username, the company has reserved the following MySpace Mail address: username@myspace.com. Users will have the option change both their URL and mail address when they set up an email account. The new service will include a feature called Mail Activity Stream which allows users to see real-time update on their friends’ activities on MySpace, providing “a real-time snap shots of the activities of everyone in the conversation”. MySpace Mail will also allow users to embed photos, music and videos directly from their MySpace profile into their email with one click. Users will be able to receive and send mail to anyone whether they are in the MySpace network or not, while enhanced privacy features enable users to receive mails from only their MySpace ‘friends’. There is also unlimited file storage. 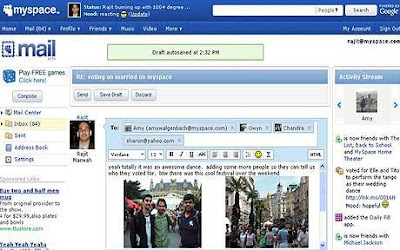 MySpace Mail is reportedly being headed up by a team of ex-Hotmail employees, including former Microsoft engineer Rajit Marwah, who joined MySpace last year from Microsoft’s Messenger and Hotmail teams. Having recently announced 720 job cuts worldwide, and fallen behind Facebook for the first time in the race to gain the most unique users, there is a widespread consensus that MySpace needs speedy strategy revamp. New services such as this email service and the imminent UK launch of MySpace Music, the ad-funded music streaming service, are two examples of the News Corp owned network trying to reinvent itself.